Keywording is another feature in Pics.io created to simplify the process of storing, finding, and retrieving the necessary digital assets. How to create keywords in Pics.io? There are several ways you can create keywords in Pics.io. Use Autokeywording option to assign keywords automatically to your assets with the help of computer vision. Upload your own own list of keywords with the help of Controlled Vocabulary option. Create new keywords and manage your entire list of keywords in the “Keywords” section on left side panel of screen. Create a new keyword in the Infopanel when you open your file for preview. You can simply type in, or simply copy&paste the necessary keywords separating words with commas. These words will become keywords attached to this asset. And Pics.io will add them to your library of keywords. Where can I see and manage the entire list of keywords I have in Pics.io? “Keywords” section on the left side panel of screen is the place when you can manage the entire list of keywords you have in Pics.io. In case if you haven’t created any keywords yet, once you open this section, Pics.io will offer you two options: “Generate for all” and “Create new”. The first option launches the autokeywording process. The second option allows you to create your first keywords manually. 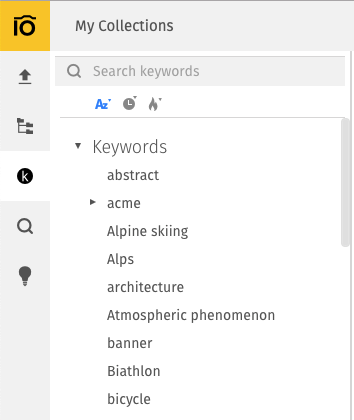 After you have created your first keyword, you can add new keywords to your list by clicking on the “plus” sign next to the “Keywords” section. Create a sub-keyword. For example, if the top keyword was “animals”, your sub-keywords can be “elephant”, “zebra”, etc. Hierarchical lists of keywords are very helpful when searching for specific assets. Add to Favorites. This button places the keyword in the “Favorites” folder on top, so that you can find it even faster. Delete this keyword from the list. If you delete a keyword here, it will be detached from all the assets it was previously attached to. How can I better organize my list of keywords? The AZ button will organize the keywords by name, from A to Z or from Z to A, depending on the direction of the small arrow. The clock button will organize the files by last used - from the most recently used to those used earlier, or in the opposite direction depending on the position of the small arrow. The fire button will organize the keywords by most used - from the most to least popular ones, or in the reverse order. You may also drag and drop your keywords and sub-keywords on top of one another to modify your tree of keywords. Or, you can add certain keywords to favorites, as it was described above. A search box above your list of keywords will help you easily retrieve the keywords you need. How can I attach a keyword to an asset? First, you should open your asset for preview. Open the Infopanel and find Keywords section. The “paperclip” button here allows you either to attach an existing keyword or to create a new one. If you have a list of keywords written down elsewhere outside Pics.io, you can also copy and paste them into this fields. Make sure, though, that keywords are separated by commas in this case. Find the Keywords section in the Infopanel on the right. Select or create keywords that you want to attach. Keywords will be attached to the selected assets.